vTuner is your guide to Internet streamed media. The vTuner platform connects your Internet enabled product to the wide world of streamed music, talk, and video. vTuner has a proven and reliable platform already used by over 60 partners. 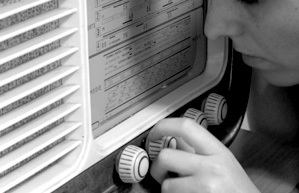 The vTuner service is used for a wide variety of products – including Internet radios, A/V receivers, TVs, mobile handsets, portable media players, PC programs, IPTV service, photo frames, hotel in-room service and more. The possibilities are endless. The amount of content we offer keeps growing all the time. At the moment, vTuner gives you access to: radio, TV stations, audio and video podcasts as well as other content like premium services, weather, horoscopes, etc. 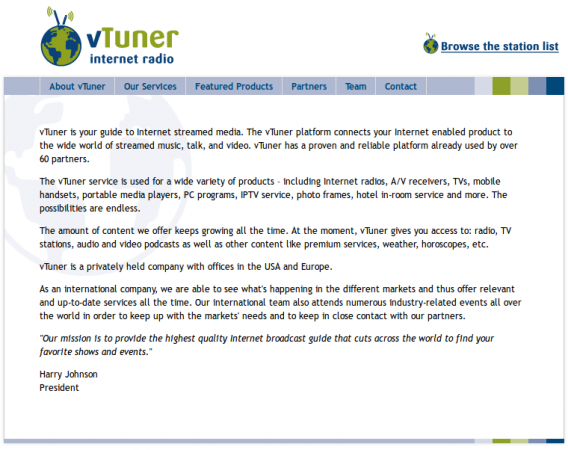 vTuner is a privately held company with offices in the USA and Europe.